Day 3 of training for Team Canada was more route-choice selection in the hilly, wide open Polish forests on a 1:15000 map. The challenge is to decide which would be the best route; a straight line through the large and numerous re-entrants or around on top of the ridges. Trails are often an option but usually involve additional climb. And there are significant challenges inside the control circle too. In spite of the excellent visibility, efficient control taking is difficult. Control locations are typically on the side of hills and the features somewhat obscure. Boulders are often very small (less than 1 metre), pits are tucked into the side of hills and swamps are little more than mud holes. It is absolutely beautiful orienteering in Poland, but it ain’t easy. A cool head and a good plan are requisites to success here in Wejherowo (pronounced “veyherovo”)!!! Team Canada and Team USA joined forces today for a star-relay training session on the Glodowko map. Both members of the two person teams were required to complete all threeloops. The terrain was quite technical and thus challenging. Both teams spent the afternoon relaxing on the white sand beaches of the Baltic Sea and eating fresh local cherries. 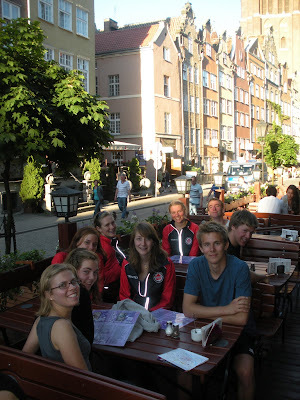 The Canadian National Junior Team has arrived in Wejherowo, Poland for a week of training in preparation of the 2011 Junior World Orienteering Champs from July 2 to 8. Our Polish hosts are extremely friendly and accommodating. The food has been traditional Polish fare with lunch as the main meal of the day. Our accommodation is very comfortable complete with laundry...an orienteering necessity. For most of the team, yesterday was our first foray into the Polish terrain. The forests here are wide open with excellent visibility. The topography is mostly rolling hills with large re-entrants. There are virtually no rock features in the terrain, thus most control features on the training maps are tucked into small re-entrants or pits, many on the sides of the hills. Staying in contact with the map is difficult, recovery is daunting. There is much to do and see in the Gdansk region. We have planned an afternoon on the white sand beaches of the Baltic Sea on the Hel peninsula after training this morning. Picture #1 JWOC team sewing bee with Graeme in charge of quality control. We’ve all been really fortunate for the hard work of Brent Langbakk, Ross Burnett, and Afan Jones. Their trainings have had us running and thinking hard as well as occasionally humbling us. I’m certainly excited for the Canadian Orienteering Championships here this summer! The terrain is both technical and physical, which should made the races exciting and challenging. Overall, the training centre has been a great success. It’s different, but awesome, to have so many motivated training partners all pushing each other. Plus, it’s difficult to be lazy with all the peer pressure (in the best way possible). 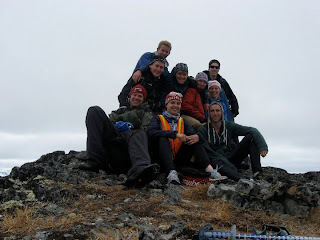 We’ve also gotten to explore, climb rocks and mountains, and some of the HPP crew biked some legs for a relay between Haines Junction in the Yukon to Haines in Alaska (a total for 240km). We hope you follow along on this blog for our adventures in Poland, and see some of you in Whitehorse for the COCs! HPP Members Eric Kemp, Graeme Rennie, Kendra Murray, Lee Hawkings, Tori Owen, Emily Ross and Graham Ereaux at the top of Mt. Lorne with friends. Photo credit: Graham Ereaux. Wednesday, June 8, the Edmonton Overlanders Orienteering Club held an HPP fundraiser as part of their usual Wednesday night event series. All proceeds from the event were donated to the High Performance Fund! The event was held a little different than usual, featuring a new event, called "The Escape". Thanks to Greg Yarkie's fantastic "City Cup" record keeping, we had a list of most of the regular club member's average Time per Kilometre from the events the club has held so far this year. Those numbers were multiplied by the planned distance for the Wednesday event, and everyone was given an estimated time. I (Will Critchley), was fortunate enough to have the fastest average TPK of the season, so the question to be answered on the night was, "Can you stay away"? The difference in estimated time was the amount of head start everyone got, ranging from 37 minutes to 7 seconds! Cross the finish line before I do, and you're a winner! Not only was this a great event for me, as it was added motivation to hammer out a really good run (though the intense race situation did cause mistakes), I hope the rest of the club members that participated enjoyed chasing and being chased by each other. It is amazing practice to try to orienteer under the pressure of someone on your tail and to keep cool under the prospect of catching someone else. Thanks to the club and all its members for the participating, and for the generous donations! And, the big question, who managed to escape? High fives go out to Angela Pearson and Einar Viddal. Looks like I need to get training for next year's hunt. Great new map and a great race! Hi all, as part ouf our oodles of orienteering training up here (in Whitehorse) we had the Yukon Champs middle distance race on Wensday night. For anyone planning on coming up here for the COC's (Which everyone should!) it was on the same map as the sprint, though a different part of course. I absolutely loved the terrain. It's a great mix of very open fast running white, with large clearings and even sandunes. The 2.5 M contour interval which is smaller than what we are used to in this part of the world was a great new challange as well. Overall this was a pretty good race for me and in the end I tied Lee Hawkins exactly at 29:37 for first place. followed closely by Graham Ereaux and the whole gang up here training. It's absolutely wonderful to have a high level of competition like this on a regular basis. It was a fun race and the perfect way to top of a good day of climbing and adventuring up here in whitehorse! Here is today's Yukon News coverage of this week's Yukon Sprint Champs with a nice quote from Graeme Rennie of GVOC who is in Whitehorse for the National Summer Training Centre. Who said training can't be fun? There are two things I learned yesterday; the mountains around Whitehorse are amazing, and climbing them is even more so. On our “day off” training, Graeme Rennie, Tori Owen and I decided to hit up the trails and climb Caribou Mountain, a 6,500 foot peak just outside of Carcross. Starting at the crack of ten, we drove the scenic rout down to the trail head (every road around Whitehorse is a scenic road) and immediately started hiking up a fairly steep trail. Shorter then expected, we reached the chilly but spectacular summit. Staying just long enough to down a chocolate bar, (which is ten times better on the top of a mountain just so you know) we attempted to glissade back down the mountain. A combination of soft snow and cold hands halted this idea so we resorted for the less fun, but still pretty amazing decent back down the trail. Greetings from the land of the midnight sun! Hey ALL! I have been meaning to write an update as the first visiting athlete of the first year of the Whitehorse training center for a while, but with all that has been going on up here, here I am with over a month pasted and just writing this! What a month it has been! What they say about people coming up north and never wanting to go home is certainly true. Up here I have gone on my first mountain bike ride… on the edge of an earth embankment that went directly into the Yukon River after about 60ft…a little nerve racking at first. I also have gotten in some skiing (in t-shirts no less! ), road biking (first time out we biked from Skagway (elevation 15ft) over the ‘summit’ (elevation 3292ft) BIG HILL! 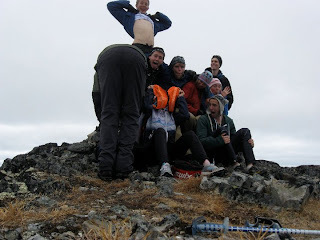 ), lots of swimming in ice cold waters, hiking, trail runs and OH YEA OOODLES OF ORIENTEERING! There are organized training sessions four times a week doing everything from intensity to VERY technical training exercises. The coaches up here Brent, Afen and Ross always come up with some kind of exercise to keep us coming back day after day! I have also become involved in volunteering as a coach while I’m here. So I also coach younger kids four times a week. Coaching plus training means a lot of new maps! It was a bit of a shock to my system when I first arrived to suddenly have a couple new orienteering maps on a daily basis. It was also a shock (a wonderful one) to have people to train with again. I still remember the feeling of my first sprint training session with the team. It involved pie plates being dropped as controls and the last person picking it up (a self cleaning orienteering route!). I couldn’t stop smiling at the end of the night. It was so encouraging to have other people to push you harder and just to hang around. After about two weeks of unemployment I got two jobs in the same day, but don’t fret it’s not like I am over worked as I still work only about 20 hours a week. The first job I got through the help of Leo the dad of the family I am billeting with and it is bussing once a week at a local truck stop called Trails North. The second job that I work at during the week is at the local knitting store called Knit Now. Both have been very accommodating to my desire to not work a lot… just enough to pay for gas so that I can drive to my adventures! The long and short of it is I am truly living the life; I eat, sleep, train, occasionally knit J and clean some tables. I can’t believe that I lucked out and this was the year that the Whitehorse training center started! Anyone who was thinking about coming up to COC’s and is still undecided, stop thinking and come! I unfortunately I have to face reality and go back to Kelowna and do my nursing practicum and will not be able to make it BUT I have pre run some of the courses and although sworn to secrecy I can still tell you it will be a blast!